Did you know at school 1 in 4 children is burdened with math anxiety? Children’s play builds math confidence instead of anxiety which can last for a lifetime. When it comes to math, such as dividing a recipe in half, checking the utility bill, or measuring a board before cutting, are you comfortable? For many adults this is a nightmare and the roots of the fear come from long before they started school. Trying to figure out which way to go when suddenly faced with numbers is like trying to navigate in a new country. For kids that haven’t seen, touched, and played with numbers before school no wonder they feel fearful and anxious. On the other hand, kids that have math play experiences greet numbers and math ideas like old, familiar friends. Run some water in a sink or bin and add a few containers and spoons of different sizes. As kids play they figure out it takes lots and lots of small containers to fill a bigger one. That’s the math concept of volume. 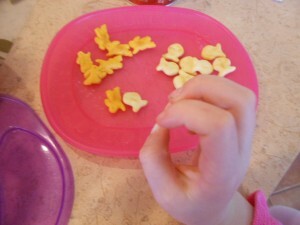 Snack time has many opportunities for counting. 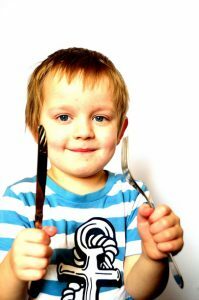 Let kids count out 10 fishy crackers, cheerios, chocolate chips, raisins, cranberries, and other little finger foods to eat up. Young kids will need help with the counting. It won’t be accurate at first. Some of the numbers will be mixed up but kids are hearing and using the number words. other toys that go inside each other are designed on relationship. Include some foam and magnetic numbers for kids to touch and explore. Kids may not know which number shape goes with which number word but brains are recording how they look and feel. Patterning is another important math skill. You can show your child a few patterns, like red car/blue car, red car/blue car. After seeing lots of repeated patterns kids can make then on their own. One-to-one matching is a critical idea. A muffin tin is fun for this. One car or one block or one tiny animal goes in each hole. Brains need to grasp the idea that one number means one thing so play experiences are critical. Setting the table is one-to-one matching too. One fork for each person. The expression to “steal a march on someone” means to have an advantage. Ordinary experiences will give your child a powerful advantage and play builds math confidence. How many ways can your child play with math today? Kids can be friends with math? While this sounds impossible, it’s critical because 1 in 4 of us, kids too, suffer with math anxiety. Make friends with PLAY. A simple and very affordable math toy is foam or magnet numbers. Kids can hold them, sort them, put them in baskets, and make them into a train. As kids are hands-on with numbers, the brain is eyes-on. It’s figuring out the lines and shapes of numbers and getting up close and familiar with how they look. Occasionally saying the numbers gets the brain ears-on too. Foam and magnetic numbers can also be used to make groups, maybe using colors. 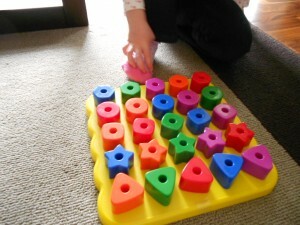 Sorting is a basic math idea and any items can be used for this, not just toys. Kids can sort the knives, spoons, and forks into their groups when helping unload the dishwasher. That’s math. Another basic idea is one-to-one matching. Besides getting the number-words in the right order, part of counting is figuring out that one object goes with one number. Each time we say a number we need one more thing. One foot needs one shoe, two feet need two shoes. One button goes in each buttonhole. Getting dressed is a great time for everyday math. 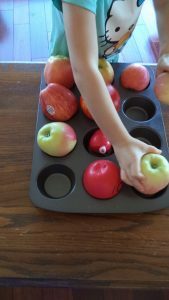 Setting the table or putting one apple in each space in a muffin tin is more math play. Looking for and making patterns can be fun. Kids can use anything to make patterns from toys to socks, or blocks to markers. Our ears listen for patterns in music and eyes look for them all around. Math isn’t just numbers, it’s also words, like more, less, bigger, smaller, longer, higher, slow, fast, and nothing. These words can be tricky to use too. The mathbox car is smaller than the toy bulldozer, but that’s smaller than a real one. Running is faster than walking, but it might be too slow when trying to catch the bus. There are countless ways to use ordinary, everyday activities and play so kids can be friends with math and numbers. 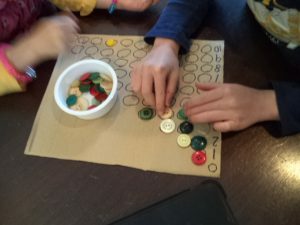 What kids of math play happens at your house or care center? Make the day count with this simple transportation counting activity that also helps to develop number sense. These are two early math skills for kids. In urban areas, there are lots of red, yellow, and green traffic lights. 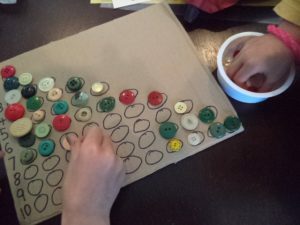 You can make a traffic light counting board with a piece of paper or cardboard. Down the left side, print the numbers from 1 to 5 or for kids that are keen about numbers from 0 to 10. Across the rows, draw the appropriate number of circles for each number. Zero has no circles, one has 1 circle, etc. To make the traffic lights, for kids beyond the everything-in-the-mouth stage, you can use red, yellow, and green buttons. Or you can use something that kids can eat, such as dried cranberries for the red and mini-Ritz crackers for the yellow. Green is a little trickier, maybe frozen green peas? We looked through our button supplies and found a dishful. 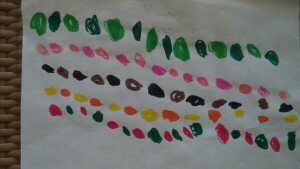 Big Sister counted and filled the circles, going in a line from left to right. Little Sister filled in the circles at the bottom corner. While Big Sister could tell the numbers when she looked at them, Little Sister had to count down from zero until she got to the name. Counting is much more than just knowing the name of the numbers and how to say them in order. Counting means understanding the relationship between numbers and objects. Each number going up means one more object. Number sense is an awareness of how many items for each number. For instance, two has one thing and another thing. That’s all. Two isn’t lots, it’s a small number. For kids, 10 is really lots. Some kids might notice how the number of circles in this transportation counting activity and board get bigger like stairs. As with so many other skills, kids develop accurate counting and number sense from play experiences and everyday opportunities. Do kids need to know how to count to 10 before kindergarten? What they need is to have some familiarity with numbers so numbers do not feel strange and bewildering. 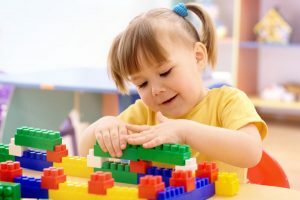 This happens by such ordinary activities as counting, talking about numbers, noticing them in the neighborhood, and using them in play activities. What do you do to make your day count? 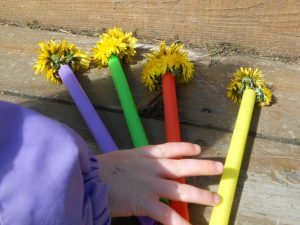 In the following article, by blogger Jenni B of DearMum, there are more ideas for early math fun. If you asked any kid, no matter how old, what their least favorite subject in school is, the answer is most likely going to be mathematics. Frankly, who can blame them? Even as adults, many of us still hate having to do anything math related, which is unfortunate since mathematics is one of the most important subjects that can shape our future. Study after study, researchers have shown that kindergarteners with elementary level math skills demonstrated better academic performance than the children that excelled in other areas. While there are a myriad of mathematical art projects that combine creativity with systemic learning at elementary levels, the skills cultivated early on will set your children up for a future academic career. This doesn’t necessarily mean hiring a math tutor before they’re old enough for school, as there are plenty of ways to teach math throughout the day, whether you’re out shopping or simply having some playtime with the kids, without making it appear as a structured math lesson. Working with prices may be too advanced for children at a very young age, but you can improve their skills in counting numbers by helping you pick out vegetables, eggs, and any other items that can be selected in multiples. Have your kids say the numbers out loud as they pick out the food. You may even ask them to add or subtract items to get a certain total. An effortless way to build early math skills in our young ones, having your kids in the kitchen with you will help them understand basic math and science concepts. The main thing you as the adult need to keep in mind is using kid-friendly recipes, ones with uncomplicated measurements and ideally can be accomplished on their own (with parental supervision, of course). As they grow older, you can also teach them about time and temperature. DearMum is an auntie of two preschoolers that love to bake cookies with her and go on grocery trips with her. With all the time she spends with her children, she tries to incorporate learning with all the kid’s activities. 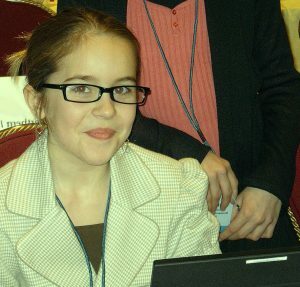 Watch out for her own blog soon!